Mayor Hall called the meeting to order. Councilmember McConnell was excused for personal business. “Under our Skin” Video and Discussion of race and inclusiveness Saturday Dec 1, from 2:00-3:30pm in the Council Chamber. The focus will be on politically correct terminology, color blindness, and safe space. The Planning Commission will meet on Thursday Nov 29 at 7:00PM in the Council Chamber. This public meeting will cover the 2018 Comprehensive Plan. Mayor Hall and Logan Bahr, Government Relations Advocate from the Association of Washington Cities presented Cindy Ryu, Representative of the 32nd District which includes Shoreline, the AWC City Champion Award.This award recognizes the hard work and dedication of our representatives championing critical city issues. Rep. Ryu has been instrumental in the development and preservation of the Public Works Trust Fund. Councilmember Scully moved that *Item 7(b) be moved to an Action item. Approved. Amended agenda approved. The Consent calendar was also approved. 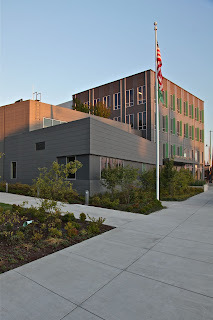 *New Action Item 8(a) Authorizing the City Manager to Execute an Interlocal Agreement with the King County Office of Public Defense for Indigency Screening Services for 2019-2020. Noted by the Mayor: this was moved to an Action Item in order to correct an error in the statement of the title. Staff has decided to amend rather than repeal/replace the Refund Policy. Now that they have been working with the current refund policies for a year, they propose amending changes to camp registration management, allow for situational concession permit refunds, and clean up some of the definitions. Councilmember Chang thinks cancellation for full refund (June 1) is awfully generous. Response: Last year we changed from no deadline to the June deadline for Camp Shoreline. This year we are adding all the other camps. This was a big change from 3 days before the start of camp. Staff is working on payment plans and deposits and looking at moving the date to April or May. Councilmember Roberts questions the use of June through August as the definition of a summer camp when most of the camps are weeklong. Although the intent is a camp occurring sometime between those months, the language needs to be more specific to avoid confusion. Staff will amend and bring back on the 10th for consent. Councilmember Scully pointed out questionable language under 8a 11, “cited as.” It would be more accurate to use “replace with a diagnosis of.” Staff will fix and bring back on the 10th for consent. Councilmember McGlashan questioned application of prorated refunds. Per day? per class? Response: Depends on whether it is a weeklong camp (per day refund), or a class meeting once per week for a month (per class refund). . McGlashan was satisfied with the response and did not suggest any changes. Hammond has been in this position for less than a year and is pleased to be working with an excellent team of lobbyists in Olympia. They have successfully retained Kathleen Collins of Capital Strategies Consulting and her new partner Debora Munguia, both experienced lobbyists. The role of legislative priorities is to provide clear direction to City representatives, consistent information about city priorities, and policy guidance in the dynamic legislative environment. It also allows us to identify and work with other cities that have the same issues. The session coming up is the 105 day “long “ session where they will be setting the biennial budgets for operating, capital, and transportation. Recent elections expanded the majority, which may reduce the risk of stalemate, but we can still expect debate and deliberation that should be carefully monitored. We can expect the Governor’s budget/policy platform in early December. There are demands that will exceed state operating revenue and different revenue options are being weighed. State legislative priorities continue to be local government financial sustainability and flexibility, and State investments in support of affordable housing, behavioral health, and homelessness. Condominium liability laws should be modified to allow the market to function in a better way, while still protecting the consumer. Economic development relies on maintaining a robust infrastructure plan and we need to keep the State focused on this. Culverts could be a significant issue since the State is liable for maintenance of culverts it controls. Since they are not all state controlled, we will need a collaborative effort to address the complex system of jurisdictions. Three main projects that will be watched in order to maintain visibility for possible State funding in the capital budget are N 145th St and I-5 corridor, N 148th St bicycle/pedestrian bridge, and Fircrest surplus property development. Councilmember Scully hopes condominium liability will be a top priority. Shoreline has up zoned to make buying a first home more of a possibility and thereby spur the domino effect of house buying. He urges caution when addressing culverts. He would like to see money from the State to help Shoreline fix its culverts. However, we need to identify the most important culverts. There are organizations that have studied this and it should be addressed in the most scientific way. The State has to work with cities - not just give money to a city to fix them. The priorities need to be set statewide. As respects Fircrest, he asks that no particular agenda be put forward, and the city not be committed to any particular type of project until Council can discuss it. Deputy Mayor Salomon agrees with Scully’s comments regarding condo liability. Regarding the culverts, this came about from the U.S. Supreme Court decision that part of the tribal right to fishing requires fish. As a result, we need to reverse some of the blockages because the culverts are too small for fish to return to spawn. Did the court decision require cities be a part of this solution or just the state? Answer: it is the state. However, the State is willing to work with the counties and cities - rather than just delegate this to them, and it needs to be addressed as a whole and not piecemeal. Councilmember Roberts agrees the State needs to develop a system wide approach to culverts. That’s the key part. Funding for the cities to fix their culverts is the second part. Roberts shares Scully’s concern about Fircrest. He wants clarification of what written material will be provided to legislators as policy direction. Councilmember Chang wants the 145th and I-5 intersection to be done by the State. Scully agrees. This is the State intersection. We need to push this hard. Next 148th and Fircrest is still a discussion issue. Roberts would like to set a priority for exempting hygiene, and non-prescription medications from sales tax. Prescription medications are already exempt. This is very regressive. Scully comments that this is more of a State issue than a City issue. He agrees but feels we’re getting too broad in our list of priorities. Mayor Hall is not sure it’s a priority as a city. We are facing the salmon issue, orcas, storm water, trees, but nothing about the environment. Should we be asking Olympia to be looking at the environment? Climate change? Salomon stated he will work on these issue when he’s in his new job as a legislator and thinks it’s important for the city to express their concerns. Chang asks how long of a list is too long? We need action on these items. Roberts says you want to stop at one page. Councilmember McGlashan agrees with the condo liability issue. It should be noted that people downsize in addition to purchasing new homes. There is no place other than condos to downsize in Shoreline. This is an important issue. Is there some way to bring this closer to the top - not as a standalone, but to highlight its importance to Shoreline? Mayor Hall agrees but feels it is being emphasized on a different page. McGlashan supports environmental and climate change directives. He also agrees with a hygiene and non-prescription medications tax exemption, but that doesn’t seem like a city issue to him. It does seem odd to him that there isn’t anything in our priorities about the environment except culverts. Something should be added. The Mayor proposed that Staff be tasked with coming up with some proposals for environmental priorities. This Item will be returned as an Action item, rather than Consent, for review of what Staff comes up with. The natural environment should be the Council's priority and on the top of the list in every decision. I know some council members remember "Enviro-Drain" stormwater filters that retrofit catch basins. Fixing culverts without filtering storm water is putting the cart in front of the horse. Stop kicking the can down the road. Ask any 3rd grader where the food chain begins,hint, it ain't salmon.